This little DIY backyard lounge is especially perfect for those who love going to the beach since the structure resembles a cabana/palapa. Measuring 8 ft long, the deck fits a queen size mattress and even allows for a small walking space in front. Each side has a narrow counter top so you can place your mugs, books and items that you want to be within your reach while relaxing on it. The awning fabric cover can be removed easily since it’s simply secured in place by the weight of the conduit pipes inserted at both ends. It’s beautiful, cozy and simple to build! So if you want to make your outdoor space feel like a vacation, then start building your own outdoor cabana lounge now! 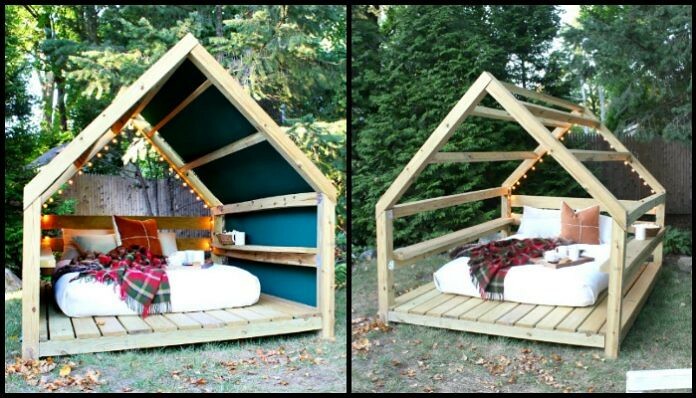 Do you know someone who’d love to have this in their backyard too?